Here’s the thing: I’ve been in a bit of a funk this spring. It’s not to say that I haven’t been happy, or that there is anything specifically wrong. But I think there were a few negative things that wedged themselves into my brain and just wouldn’t get out. It doesn’t really matter what they are or were. I think what matters is that I had to experience that for awhile before I could shake them and move on. What also matters is that I feel it lifting. In a funk, my instinct is to retreat and hide. Wait for it to blow over. I thought that posting less on Instagram and doing calm things that help me re-charge might help. But it didn’t. Ultimately, getting out into the world and connecting with other people is what worked this time. Going to Mid-Atlantic MOD helped. I met some really inspiring new friends there, and I spent time with my own guild mates who I hadn’t seen in awhile. 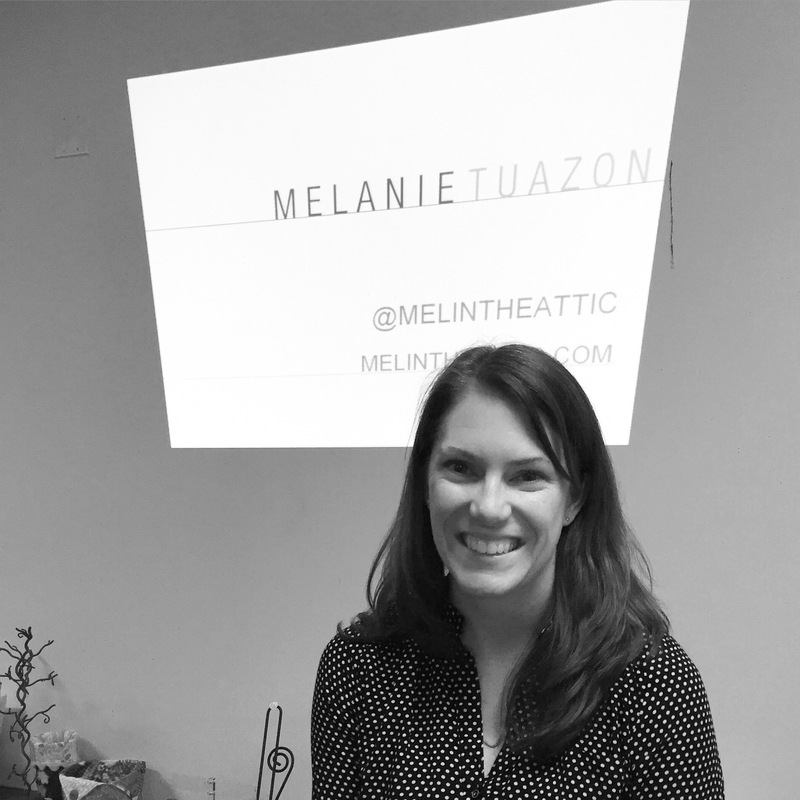 Last weekend, I attended a lecture and workshop by Melissa Averinos* that made me push the boundaries of my own creative process. 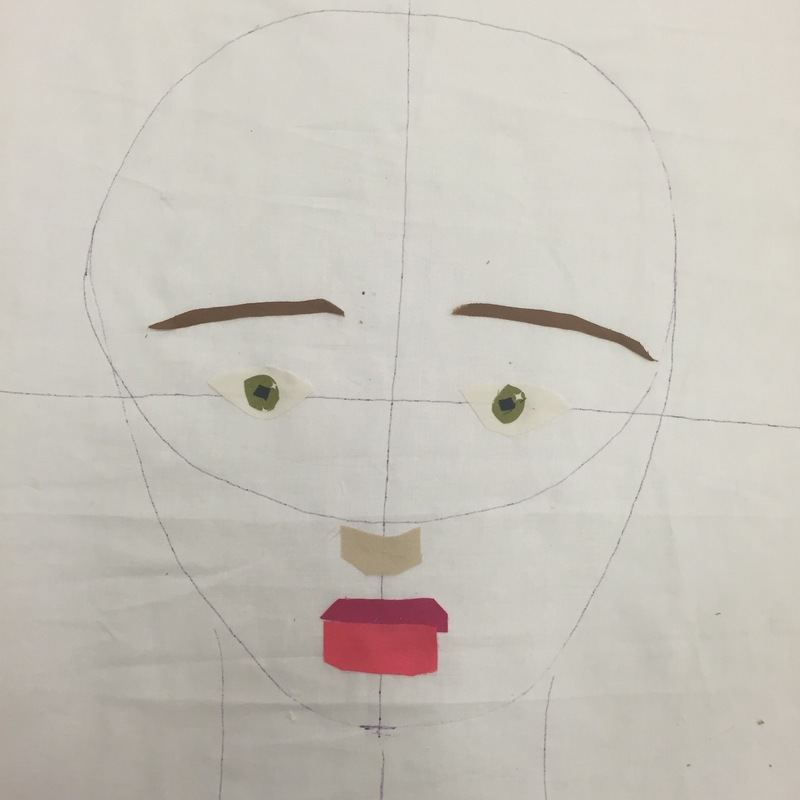 She taught me how to draw a face and then make one with fabric collage. A face. That looks like a human person. It was extremely empowering for me. The lesson that I keep repeating when it comes to my work now is, “don’t be too precious.” I do tend to get very invested in a piece, sometimes to the point of stopping short of making it truly awesome. It’s a new facet of Dare to be Awesome. Don’t be afraid to keep pushing it farther into awesomeness. Don’t be precious. Melissa’s remedy for being precious is to work in a series. So I really made three faces, purposely experimenting a bit with each one. 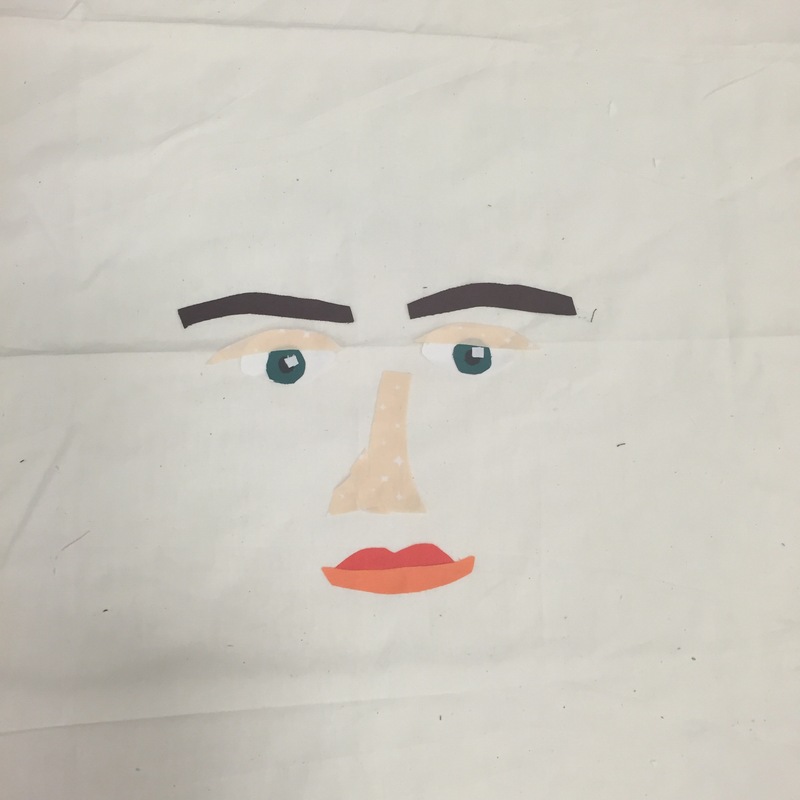 I will never look at a face in the same way again. But I think I still have a ways to go before I fully practice a lack of preciousness, because I fell in love with this one. She looks like I felt in the funk, a little worried, a little too preoccupied with beauty. I hope to finish her next week. So many good things to think about. And Melissa came along at the right time. I needed her inspiration for my next big leap of faith. 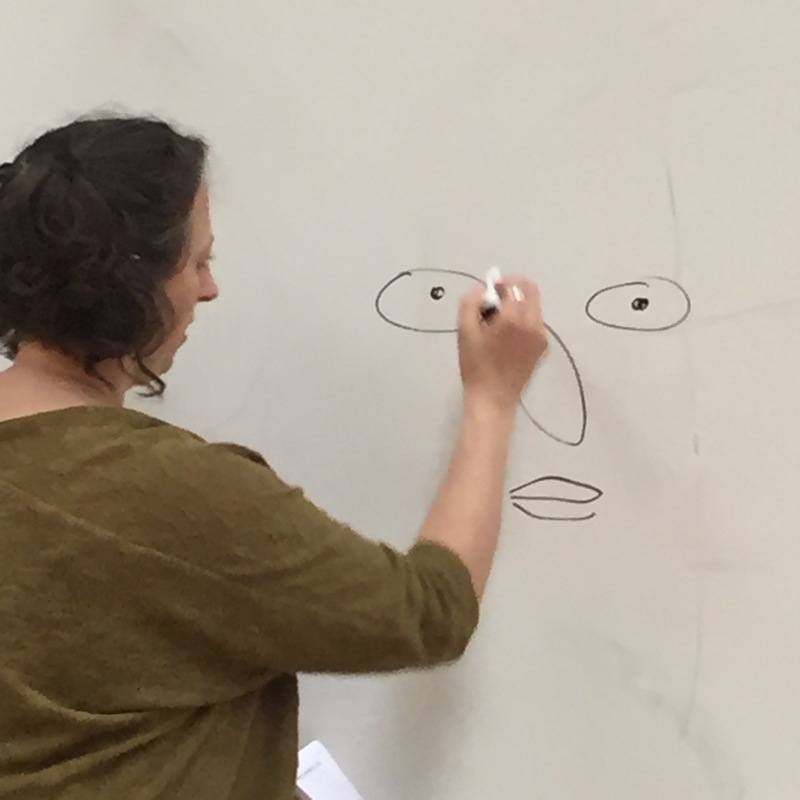 I gave a lecture. I did it. I got a request from the Long Island MOD quilt guild, to speak to the guild about my evolution as a quilter. And It was very exciting, but also terrifying to me. Partly because of the funk, and partly because public speaking can be scary if you don’t exercise that muscle. But you know what? I knew enough about myself to really do the work and prepare. And once I got started, it just rolled along, and my 45-minute talk went well over an hour. 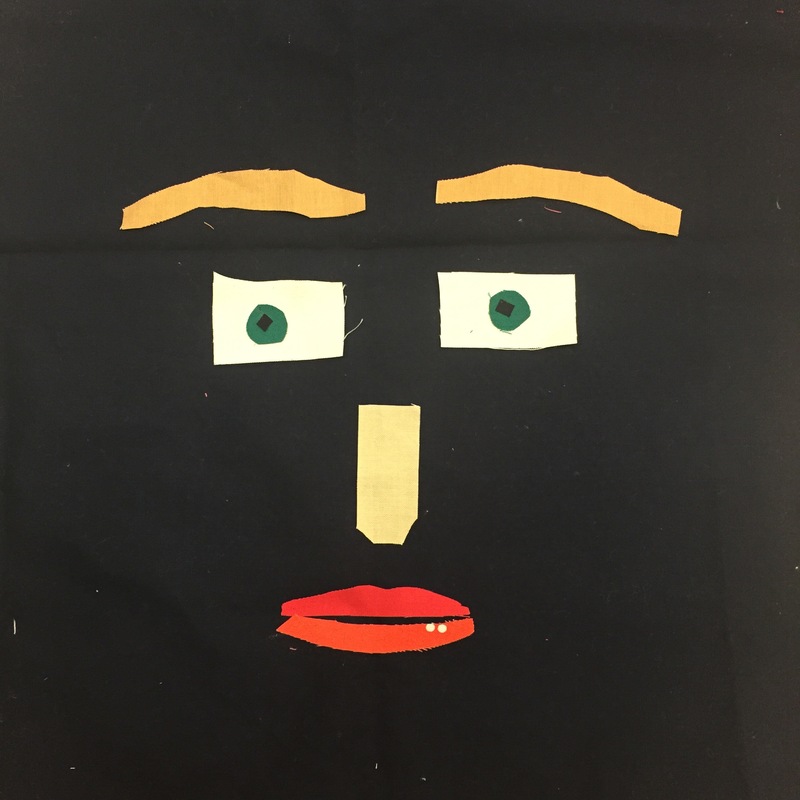 The members were kind and generous, I brought about ten quilts to show, and we just got geeky about quilting and process and how quilt people really are some of the best people out there. Step three of my funk lifting was to go to my own guild’s meeting last night. There were slow stitching demos in visible mending, embroidery, and hand quilting. There were sweet people and sweet treats. 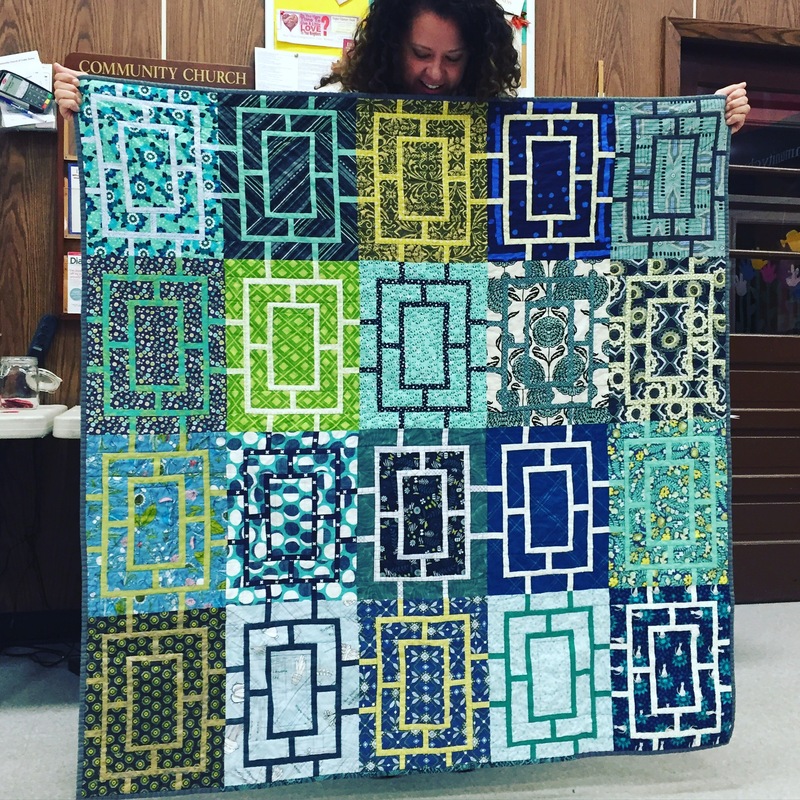 Tracy even had a finished Peek quilt to show! Isn’t it gorgeous? The final step is that I finished the matchstick quilting portion of my massive semi-secret quilt. It’s on to the next step, which is something equally slow but completely different. I’ve also been looking to finish the projects I’ve been working on, start new projects, develop new designs and pitch them. With spring comes reinvention and re-emergence. Happy spring. 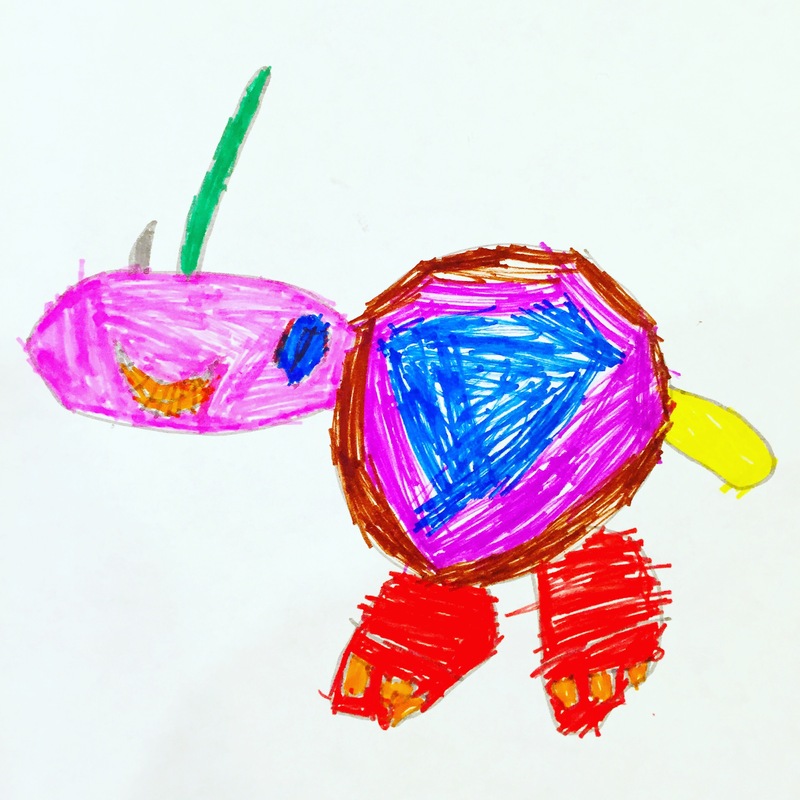 Have a happy rhino made by an awesome kid. He is fantastic at chasing funks away. * If you don’t know Melissa Averinos, take a little time to check her out. She is a painter/quilter/artist who lives on Cape Cod. Her quilt “My Brother’s Jeans” won Best in Show at Quiltcon this year. 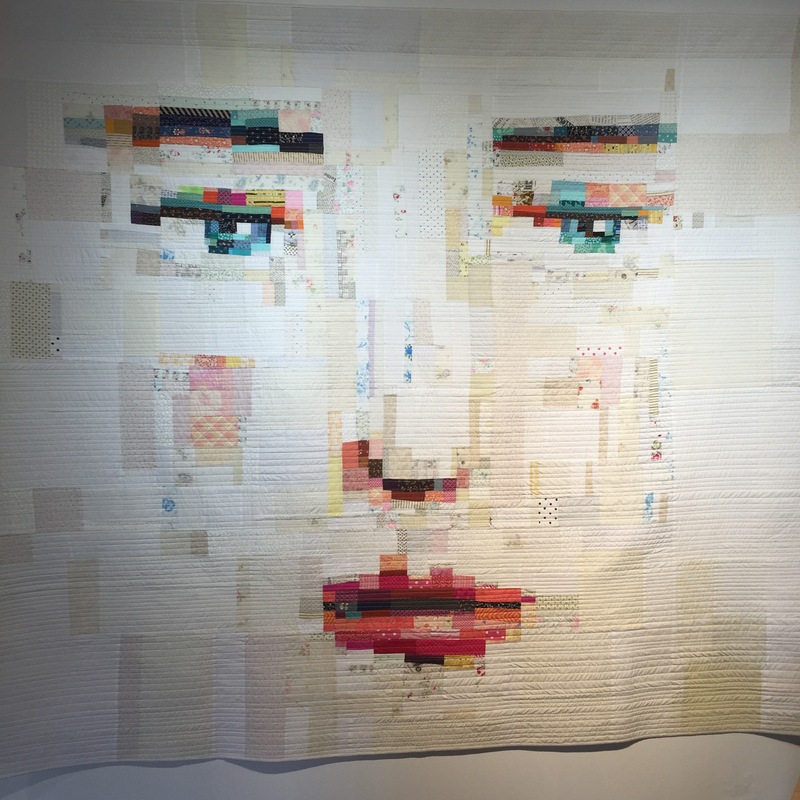 And her face quilts, which I got to see and photograph at a gallery in Providence in March, are fascinating. Also, she is a sweet soul, totally funny, and one of the best huggers I have ever hugged. Your collage lady is really lovely, and you know I love your quilting. I’m glad you’re exploring new processes to your creative outlets. It is good therapy. Yeah, that’s part of the funk’s funkiness. Sometimes it takes a little while to find the cure. It’s not a fun process, but I always feel stronger for it. Funks happen. You identified it, took charge, made changes and now it’s going away. Well done. 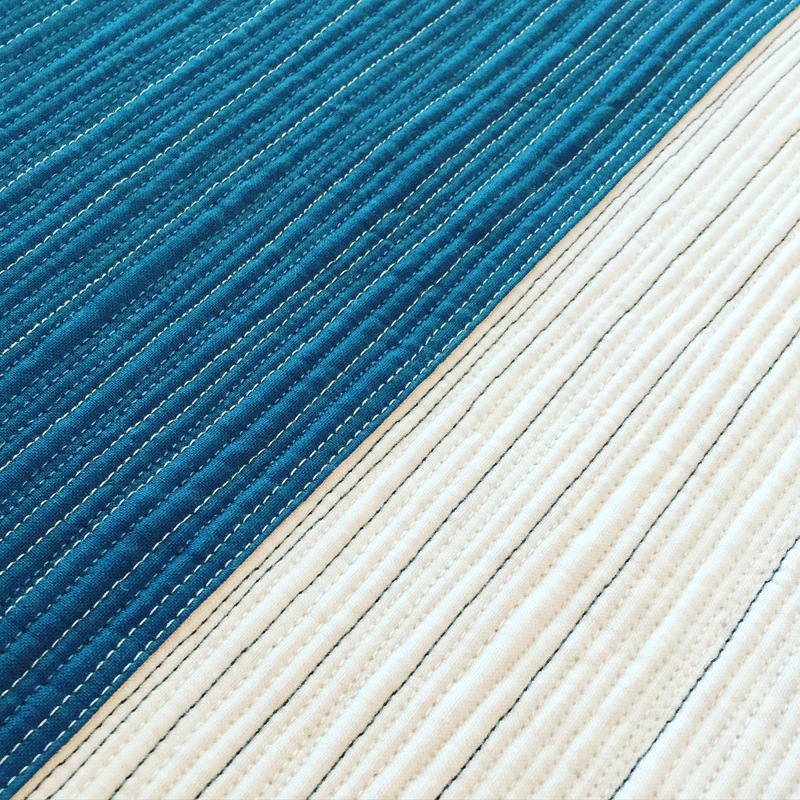 And that matchstick quilt – whaaaaat?! I so completely wouldn’t have the patience (yes, OK, I can hand stitch queensize hexagon quilts but that comes from a different brain compartment). You’ve had some fun, you’ve educated yourself and you’ve had a magic hug or two. More coming your way, and welcome back. Precious. Interesting. That word has so much behind it, doesn’t it? Like we make the precious to make them likable to the broader world, to put some sweetness over something difficult. I can imagine chasing away the precious as very therapeutic. I love the way you see things M and love learning from you! Yes, it’s a concept I’d love to think and write about more. It’s not healthy to be precious about the work as it’s being created, but you want the thing to be precious to someone who will love it. I’ve become someone who is so compelled by the creative process. Guilds and retreats always get me out of funks, too. Hugs to you, friend. This was a beautiful post. I love your work on the faces, so interesting. Thank you so much for coming to speak with us at our guild meeting, you were very inspirational and heartfelt. I really appreciated hearing about your journey and process, and your quilts were amazing to see in person. I loved what you said about quilters, thank you! I like that your emerging from the funk was a three part process. Last month and early this month I pushed too hard for too long, and too intensely, and totally burnt out. I am in the funk now, but trying to stay involved…but since that hasn’t helped, perhaps I need to retreat and hide. I love all the faces you made, but that last one is really my favorite. Her coloring and hair are perfect and the green eyes are captivating! I look forward to seeing what she becomes. Hiding away and wirhdrawing is a symptom of depression and it’s the depressed brain’s way of worsening the depression. The best thing you can do is try to get out and about even if you don’t feel like t. Doing something you love and creativity are both helpful too. 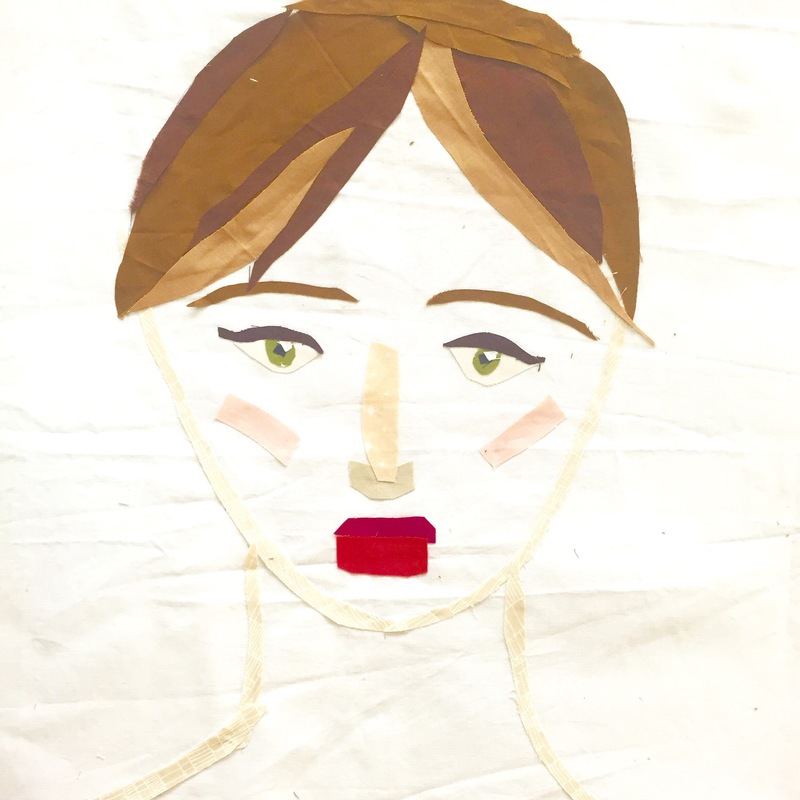 My depression tells me i don’t want to sew, but if i force myself, it can lift me a little. Wendy, thank you for sharing this with me. I’m making some big strides in self-care, and I’m glad that you are trying to do the same. Sewing is something that helps me cope with generalized anxiety, and I know that a lot of people use it as therapy. Keep stitching! I think it’s important to share these stories with each other.